More Hall on the University of Washington campus, left, and damage from the 7.1 earthquake that struck Mexico City, September 2017. When the next major earthquake roils our region, University of Washington’s civil engineers and seismic experts will not be safe. That’s because their building is vulnerable to earthquakes. More Hall was built in 1946 before modern building codes were in place and, as a result, the building’s concrete columns could explode like a fallen fine china during an earthquake. Stanton and his colleagues advise the Washington State Department of Transportation on how bridges will perform during earthquakes. 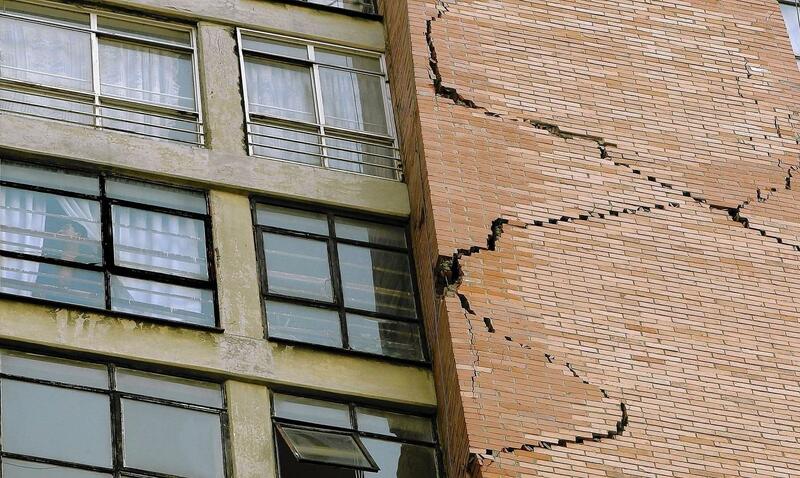 They have won awards in the field of earthquake engineering. Their work obsesses over the best way to design buildings to withstand seismic forces. UW spokesperson Victor Balta downplayed the risk of More Hall and other buildings like it. “It is true that More Hall was not built to today’s seismic codes, but then again very few buildings were as codes continue to change,” he said by email. The university’s first priority, however, is dealing with shoring up its older brick buildings (known as unreinforced masonry) over the next six years. “After we take care of all the unreinforced masonry, we will be able to move on to other seismic issues, many of which will involve very extensive renovations,” Balta said. 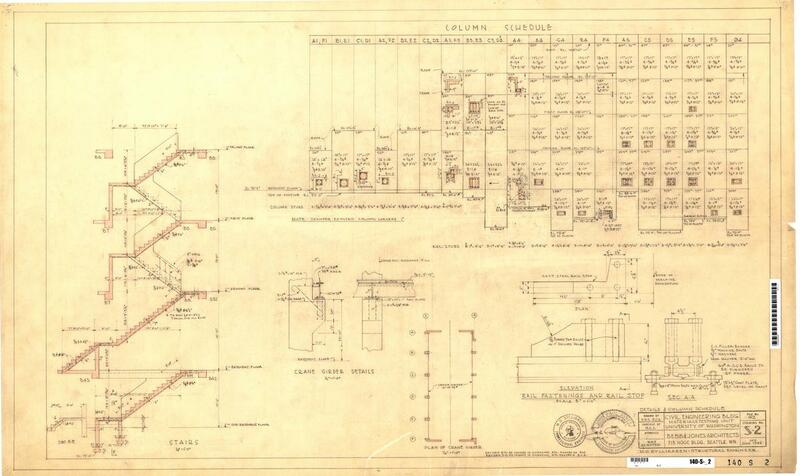 All those numbers in the top right show the building’s columns are “woefully unreinforced,” according to Stanton. Concrete columns in buildings up to modern code have a “bird cage of reinforcement” inside them, Stanton said. If you wrap a column in steel, it strengthens the concrete and keeps it together during an earthquake. There is nowhere near enough steel latticework inside the columns of More Hall to make the building withstand a large earthquake, Stanton said. In contrast, wrapping a column in steel makes it ductile and bend like a paperclip during an earthquake. “Death boxes” is the term preferred by international seismic engineering expert Kit Miyamoto. Columns built before the mid-70s don’t have much steel reinforcement, so they don’t bend. Instead, they are known to explode. Last September many buildings like this collapsed in Mexico during a 7.1 earthquake. A Mexican news site tweeted a video showing a beige, five story-apartment building that wobbles and then crumbles to the ground in a cloud of dust. Sounds of “Dios mio, dios mio, dios mio,” Oh my god, oh my god, come from a woman watching. In that earthquake, 44 buildings collapsed, 6,000 buildings were damaged, and close to 400 people died. Everett-based structural engineer Dave Swanson visited Mexico to study the damage. No one knows just how many buildings like this are in the Seattle area. But “there are a lot of them,” Swanson said, certainly in the thousands. 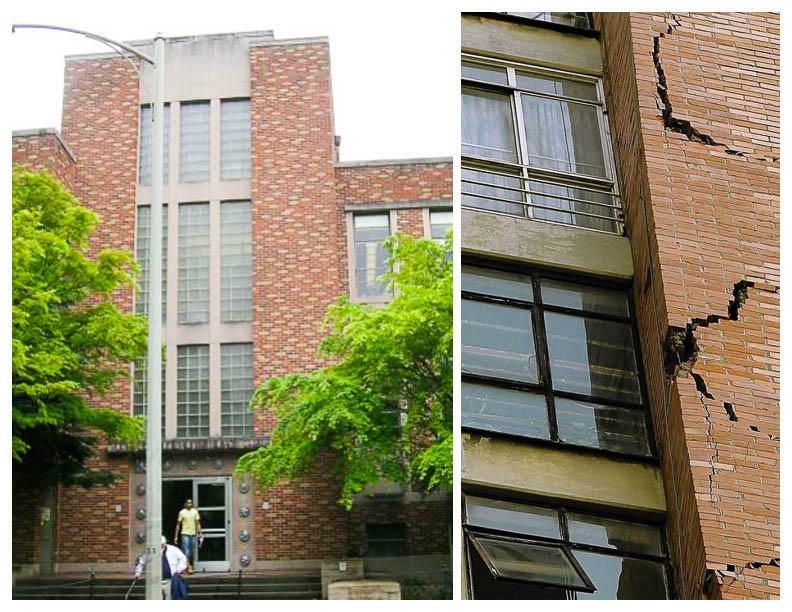 Unreinforced masonry have gotten attention from local leaders, but the City of Seattle does not have a program to address vulnerable concrete buildings. The city says unreinforced masonry seem to suffer more in the earthquakes that have struck here. Swanson is glad leaders are focusing on brick structures, but concrete ones need attention too, he said, as they are often large structures used by many people at the same time. More Hall is not the only building on campus that needs seismic improvement. The University recently put out a call for bids to work on 11 unreinforced masonry buildings. Damage of 7.1 earthquake in Mexico, September 2017. Hazard maps show the ground under the University of Washington’s Seattle campus is prone to liquefaction and will likely get a lot of shaking. What would it take to bring More Hall up to current codes?